You may have noticed the S’up Spoon getting a certain amount of media attention in the last week or so. It’s a Kickstarter project about assistive technology, and immediately interested me. Eating is one of those things that should have long ago been solved for people with mobility issues and yet it hasn’t – so I’m inclined to support projects to redress the balance. At the time of writing the S’up Spoon is at about £10,000 of the £33,000 needed to develop it further. I asked Mark of 4c Design to talk us thought the design process in today’s guest blog. I started as an intern at 4c Design shortly after graduating. At the start of the internship I was introduced to the intern project; the objective to work in a charitable capacity to meet the needs of a real life client. Past intern Hannah Jenkins worked with a young boy named Lenny with a rare lung disease to develop an ergonomic backpack to carry his oxygen supply. I was introduced to Grant Douglas, who has cerebral palsy. Grant wanted a spoon that could hold contents more securely. Our first meeting was at Grant’s flat in Edinburgh as we felt it would be crucial to see his living environment. In all honesty, I was a little thrown. I’d grown up in a bit of a bubble in my home city of York. I was amazed with Grant’s attitude and his determination to improve things and make them work better for himself and others. Grant demonstrated the problems he faced with eating and explained what his concept was: a spoon with a lid. The benchmark for success was allowing Grant to eat cornflakes! This is where the project started for us. Back in Glasgow with a clear direction and lots of ideas, I began by understanding the problems by looking at video footage we took of Grant. I found that spoons just don’t allow for erratic arm movements; no matter how much you try to counterbalance the spoon it would never hold the contents securely. I became frustrated, as Grant is, with products currently available that claim to solve the problem but in some cases make it worse. I hosted a brainstorming session with the 4c team where we looked at issues surrounding the spoon’s durability, social element and function. These are three key areas we needed to focus on for the product to work for Grant. The guys get a little excited with the idea of using mechanisms or clever materials, but it didn’t take long before we realised that the best route would be to have a simple form. The spoon would be a product Grant could keep forever, so the easier to clean and maintain the product the better. I then presented Grant with first stage concept prototypes and sketches. These varied from an ice-cream scoop with a lid to a large plastic bulb! Grant was really excited trying out the giant bulb prototype. It’s crude, it looks rather odd but it enabled him to eat liquids. Building on this idea, I developed different spoon heads and used 3D printing to prototype them due to their complex form. Coupling these with solid foam handles allowed Grant to mix and match the heads and bodies until he found some options that worked for him. When he was happy we gave two of the prototypes a better grip and presented them to him for Christmas. The feedback we got was fantastic. These prototypes have allowed him to eat foods that were previously impossible and also improved his social experience in restaurants. Recognising the spoon’s potential, myself and the team at 4c decided to develop the spoon further to assist anyone who was frustrated eating due to shaky hands. Piece by piece I changed the spoon to make it work for a wider audience. This was done by making it ambidextrous, refining the cavity and tweaking the handle for different hand shapes. The original concept aesthetics were quite angular so this was made much softer with a universal appeal. The form has directed the design throughout the process. It was important for this product to look cool, have people question its purpose and not immediately associate it with a disability. By removing oversized grips and tubular forms I think it’s done just that. The final spoon may at first appear a little over engineered for some potential users. However it is designed so that it suits a wider range of abilities – even people with small tremors should see benefits. One thing that has proved a bit of a battle was Grant’s goal to eat cornflakes: they stick to anything and were difficult to get out of the cavity! For weeks I spent time in the workshop playing with materials and coatings to try and get a cornflake to slide off a surface – to no avail. Now, after lots of research, the spoons will be manufactured in Tritan, which is a bit like a non-stick pan. This means most food will slip out of the cavity when the spoon is turned upside down. We are using Kickstarter, a crowdfunding platform, to fundraise for its production. This is new ground for assistive products: if we can get enough people pledging to buy a spoon before 2nd October, the project is funded. If the campaign isn’t successful no one loses any money. The hard work of designing has been done; now it’s spreading the word far and wide. 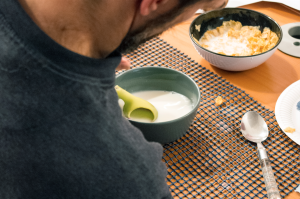 Please visit the Kickstarter page and share with family and friends – this little product has the potential to make a big impact and transform the experience of eating for many. Not just for those with cerebral palsy but those with Parkinson’s disease, essential tremor and other people with unsteady hands.